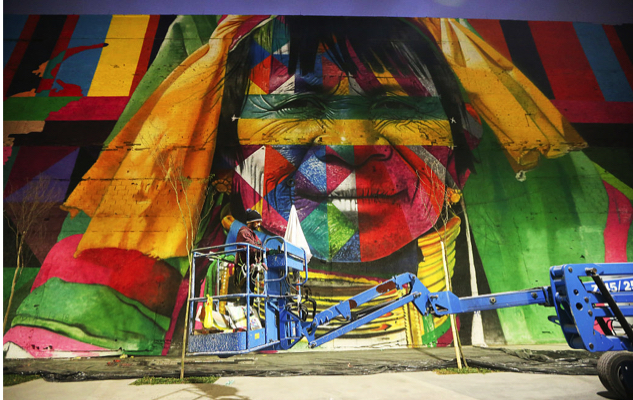 And now, for something pretty spectacular going on in Rio: renowned street artist Eduardo Kobra is placing the final touches on a breathtaking mural for the 2016 Olympic games. 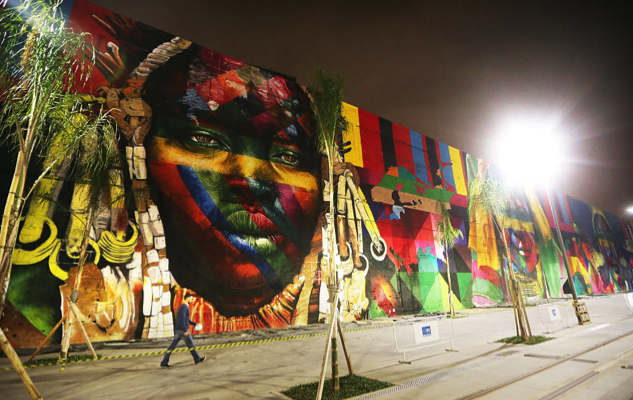 Located in Rio’s Port Zone, the work is one of the largest murals in the world at 32,000 square foot meters wide and 15 meters high. According to Brazilian news channel Grupo Globo, Kobra started work on the mural at 7:30 a.m. each morning and worked 20 hours in the hot sun everyday for six weeks. The results are titled “We Are All One” and show five faces representing the five main ethnic groups of five continents. The number also matches the number of rings’ in the Olympic games’ logo. A formal inauguration ceremony for the work will take place on July 30, just under a week before the start of the Rio 2016 games.The mural’s Port Zone home is set to be one of three “live zones” during the Olympics that will host music performances and free entertainment for the public.